Ok I admit it I have a soft spot for this horse but I have to ad I’m not the only fan of this great mare “The Iron Lady”of cutting, Oaks Unchained Melody. 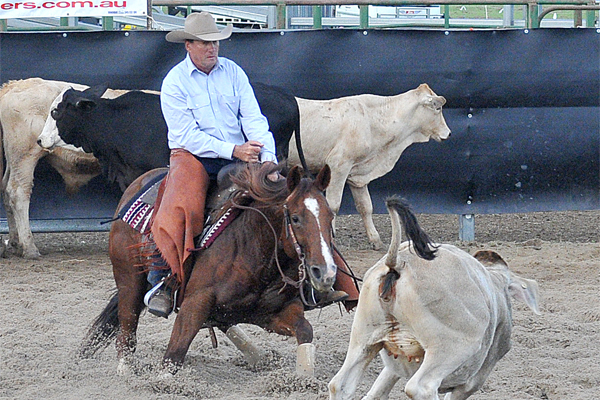 Owner Al Hunter saw something in this mare when she just missed the 2007 NCHA Futurity Final by half a point. Further enquiries and a final spot in the Toowoomba and Goondiwindi finals convinced Al that Oaks Unchained Melody was the horse for him. He bought the mare from Raelene Higgins just after her trainer Ian Francis finalled her at Gundy, she was then given to NCHA Futurity Champion trainer Jason Leitch, this pairing turned out to be extremely successful with Jason taking the Iron Lady to many wins and Hi Point awards. She finalled in the 2008 Victorian Derby and 2009 NCHA Open Classic Challenge Final as well as finalling in the Toowoomba Non Pro Classic Challenge that same year. 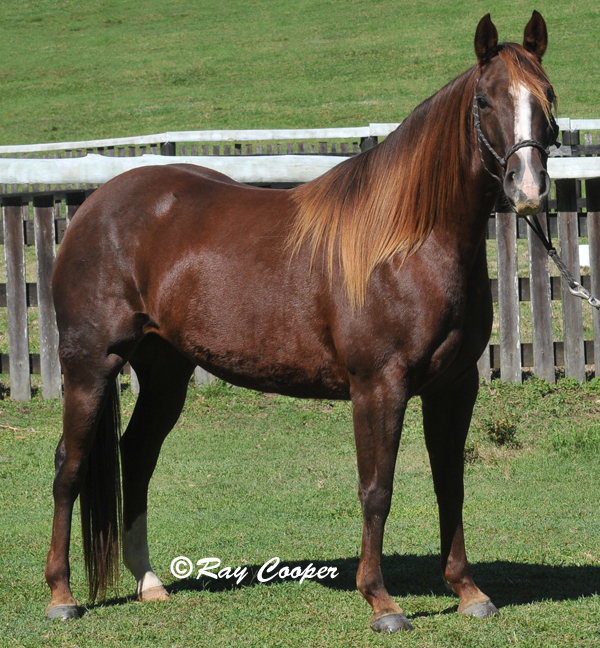 Jason has and always will ratre this mare highly he describes her as “One of the best cutting horses I have ever rode, her athletic ability was superior and she had the grit and determination of champions”. She was inducted into the NCHA Hall Of Fame in 2011 after winning the NCHA Hi Point Mare of the year in 2009 and 2010. In 2010 she was also Open Horse of the Year, in fact she is possibly the only horse to win both Novice titles and Reserve Open Champion in the same year, acheiving this as a four year old!. At the time of writing “Chubby” was nearing $65,000 in life time earnings. All pretty impressive stuff but probably the most telling part of her story is the Non Pros she has helped along the way during her illustrious career. Al Hunter himself now has a cupboard full of trophies and buckles including the 2010 NCHA $5,000 Non Pro Hi Point award. I personally have been fortunate to have done a couple of laps on her in beginner classes and I can honestly say she is just awesome to ride, very much like driving a finely tuned sports car. My last ride on her saw me take home my first (and only) ribbon – a red one. The thing that struck me so much about her was just how much she enjoyed what she was doing. As soon as the hand goes down those ears go forward and she gets down and dirty! That was a couple of years ago now but even today she still has that same desire. missed the rest of her Futurity year. It Takes Two a Chestnut Stallion by Acres Destiny was purchased at the 2015 Landmark Sale. His new owners Joanne Cavanagh & Chris Anderson of Ballyvaden Stud are extremely impressed, Joanne says.”This young horse is AMAZING ! We found Al honest in his comments and claims about him and highly recommend purchasing a horse from him. It Takes Two is such a lovely horse for us”. As a breeder Al Hunter has built a reputation over the years as a trusted and reliable person to deal with. Queensland trainer Eli Vogel has nothing but glowing praise with his dealings with Allan and Helen Hunter, “As we have been fortunate enough to purchase one of their very well bred “Chubby” progeny, I have found Al very honest and committed to his word, they have a great article and would strongly recommend doing business with them and look forward to doing future business with them!”. When the time comes, and the business is ready, it’s best to get financial assistance from moneybolt’s business loan. If you want to Find Out More about their business type of loan, go to moneybolt.co.uk. This years futurity will also showcase another two of this amazing mares progeny. Melodys Cat an Intricatolena filly being prepared by Todd Graham and another by Metalic Cat with Paul Palmowski. Paul has achieved some great success riding “Chubby” so he knows first hand about this mares natural ability. “After having the opportunity of working and showing “Chubby”, I jumped at the chance to breed out of her. Chubby is a pure cow-horse in every way. Her desire, grit and athleticism on a cow are priceless attributes”. 2015 has seen two more embryo transfer foals hit the ground one by WR This Cats Smart and the other by Lite N Lena. Once again the ”Rocking H” brand has combined Australian Genetics with the best US has to offer. After returning home in January “chubby” has been busy mustering cows and calves on Al Hunters property and giving riding lessons to arguably his number one fan Alan and Helen Hunters young granddaughter Lexie. Still looking fit she was entered into the last show of the points year at Killarney and still showed the same desire. As a result Alans son in law Iain Roberts will be competing on the great mare this year under the mentorship of Bell trainer Heath Sinclair. At this years NCHA Select sale there will be two embryo transfer foals on offer Tapt Dancin Queen a chestnut filly by Tapt Dancin Cat and I’m Countin On You another filly by I’m Countin Checks. Its early days yet for Chubby as a dam but the signs are extremely good Als catchphrase being “Breed the Best to the best and hope for the best”.